The kitchen is considered the heart of a home. And for good reason. 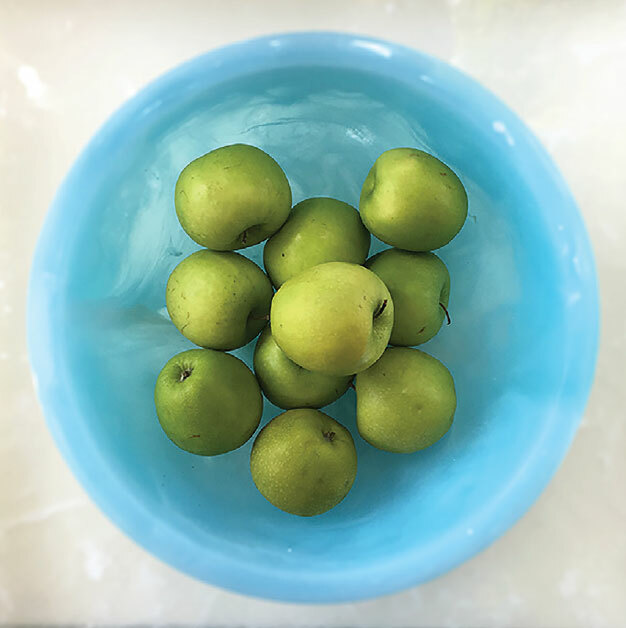 A space built for cooking, eating, and conversing, the kitchen sustains families by providing a spot for daily connection. It’s the first place we connect in the morning, often the first place we come to decompress after work, and it sees many-an-evening filled with homework, good smells, toasts, and entertaining. In many ways, the kitchen binds families together, and, as we learned from our kitchen specialists, it does the same for homes. When Jennifer Conrad moved to Sun Valley, she came for the snow and for family. Her brother had already lived in the famed ski town for several seasons when she arrived from Connecticut. A fine arts student at Green Mountain College in Vermont, Conrad needed to find work in the Valley that suited her creativity. She married a contractor and discovered a knack for reworking floor plans. “I cook all the time, so naturally I loved working on kitchen designs,” she says. “I saw that there was a need in town for kitchen design so I went back to school and got a design degree. I then purchased Five Star Kitchen & Bath and grew it from there.” And grow it, she did. Five Star Kitchen & Bath is now a full-service design firm that creates spaces from concept through construction in rooms all over the house. Drawing upon skills from her fine arts degree, in conjunction with her National Kitchen and Bath Association (NKBA) degree, Conrad aims to merge the beautiful with the practical. Timeless designs include mixing materials in a way that feels current and simple, minimalist yet rich. Conrad and her team use a lot of manmade countertop materials like quartzite because they are easy to maintain and are very consistent in their patterns and colors. 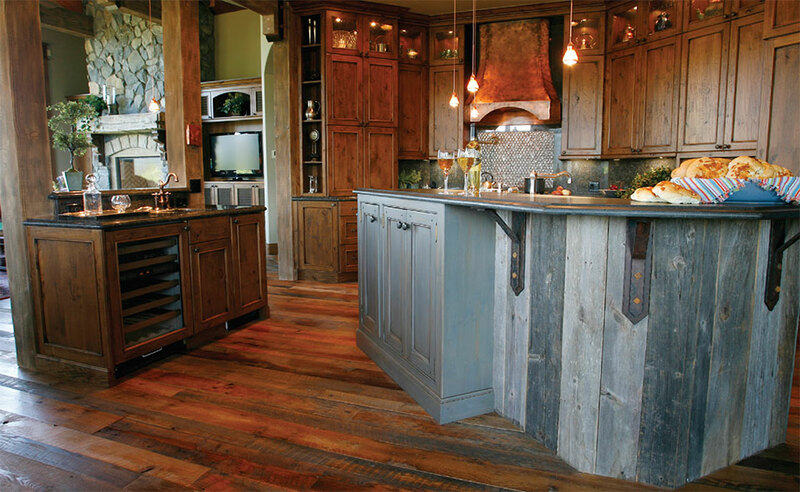 The Five Star Kitchen & Bath team makes sure to match whatever countertop their clients choose with specific types of wood to create a consistent look. When it comes to appliances, Conrad says that stainless is the most timeless option one can choose. Where the real skill comes in is combining these practical measures with visual balance. Conrad and her team layer kitchen design with considerations of heights and depths of cabinetry, texture of materials, and symmetry or asymmetry of the space. “We do an extensive survey with new clients to get an idea for what they want,” says Conrad. 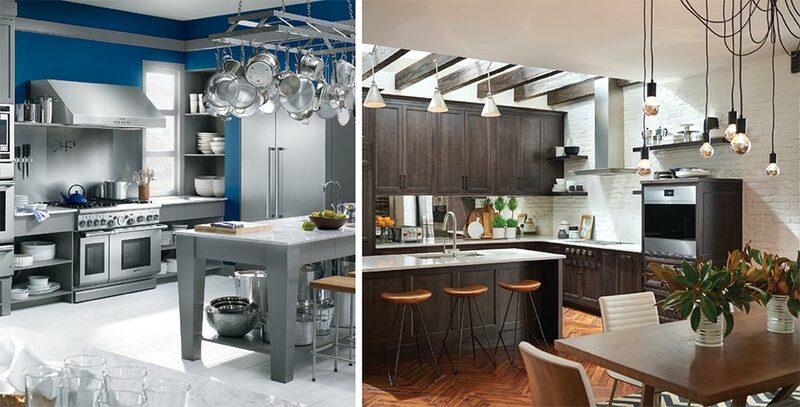 She notes that the world of kitchen design is so vast that a series of questions can help clients sort out what specifics are best for their aesthetic and practical tastes. Every client is different, and Five Star Kitchen & Bath prioritizes individual needs through personalized service and focused conversation. Jim Taft has been working in the trades for 42 years. And he has spent 40 of those years working for himself. His entrepreneurial spirit has taken him to different corners of the construction industry—from custom work in California, to general contracting in the Wood River Valley, and back to custom cabinetry—this man has seen it all. Such a breadth of knowledge in the industry enables him to use a hands-on philosophy with his projects and work collaboratively with other professionals in the field. “I came into this business for my love of woodworking,” says Taft on a busy afternoon in his spacious Bellevue workshop. He speaks to the joy he gets from spending time creating something both beautiful and useful. Crafting a wooden boat takes time, focus, and serious attention to detail. The final product not only needs to be beautiful, with connecting lines and a perfectly finished outside, but it must also be practical. The thing has to float. Taft carries these attributes into his custom cabinetry business as well. He keeps his hands in the pot from the start of a project through until its finish, collaborating with architects, designers, and builders along the way. Taft collaborates with other local professionals to bring the best final product into being. 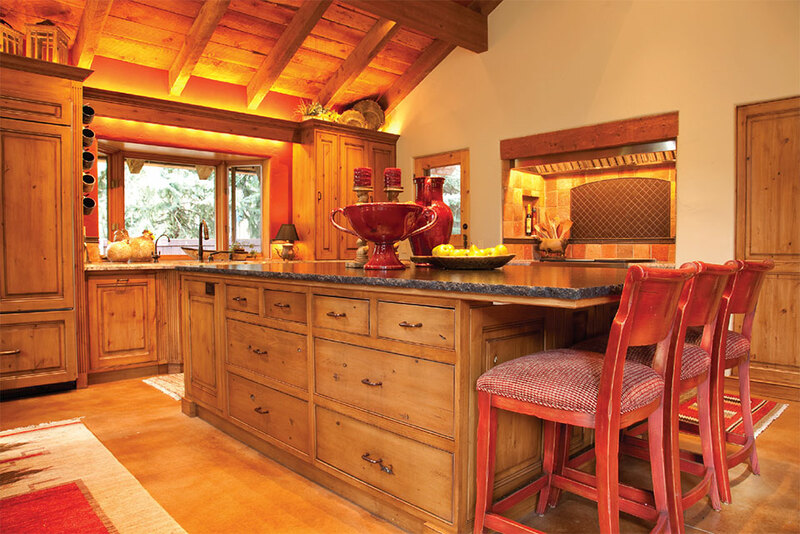 For example, he connects with other local businesses to produce custom cabinetry for their clients. He also works with local fabricators to produce quartz countertops and solid surfaces, which is just one of a growing list of his products. Entrepreneurship takes resourcefulness, communication, skill, and creativity. One look at Taft’s custom design work will speak to the value of his background in producing only the best final products for his clients. Terry Murphy lives for tabletop design. The owner and operator of Bellissimo on Sun Valley Road runs her business like she sets her table: with flare and a personal touch. Walking into her shop, clients are transported to places all over the world. Her dishes, napkins, and accessories come from such places as Paris, New York, Germany, Prague, Peru, and craftspeople from all over the U.S. 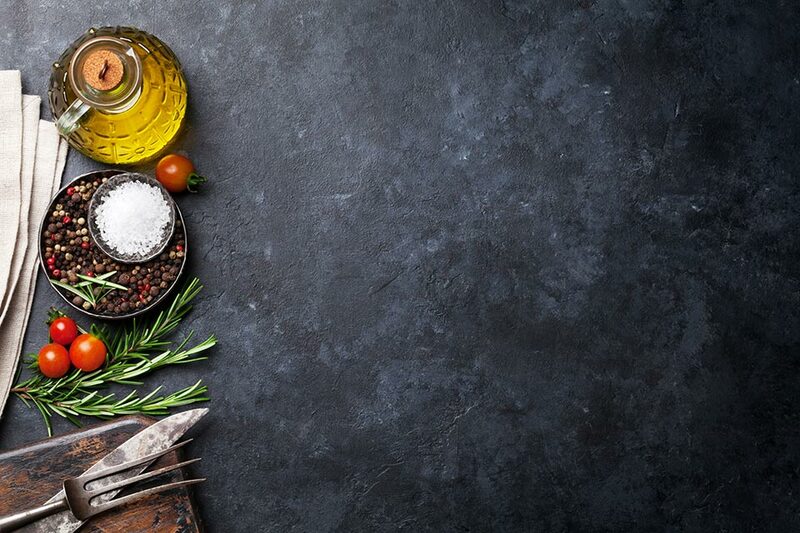 Working alongside clients and designers, Bellissimo helps select pieces that will last in a kitchen all year round, or enliven it for one special event. 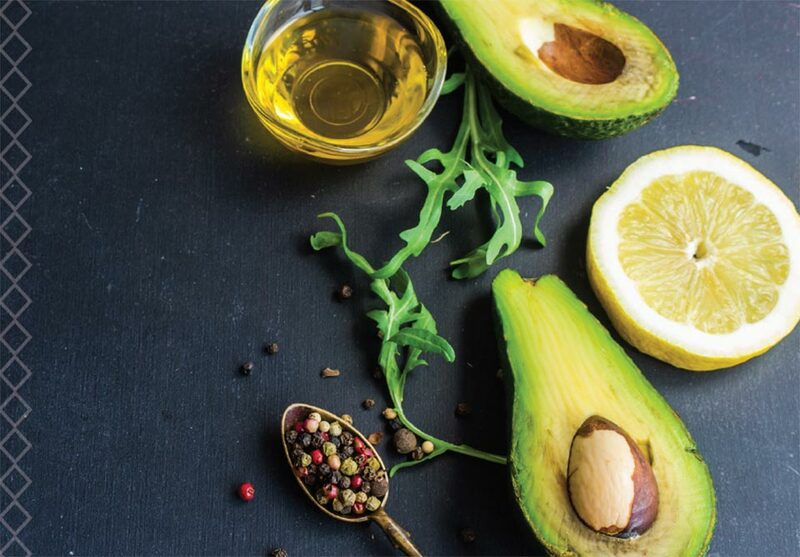 Especially during the summertime, the possibilities abound for what can rest on your table. As we open our doors and entertain more regularly, the themes of the tabletop can change, morph, and shine as you see fit. “Anything belongs on a table,” says Murphy. She dives into tales about using tin foil and LED lights to awaken a sushi party, or children’s wooden blocks to spell out names at the kids’ table. 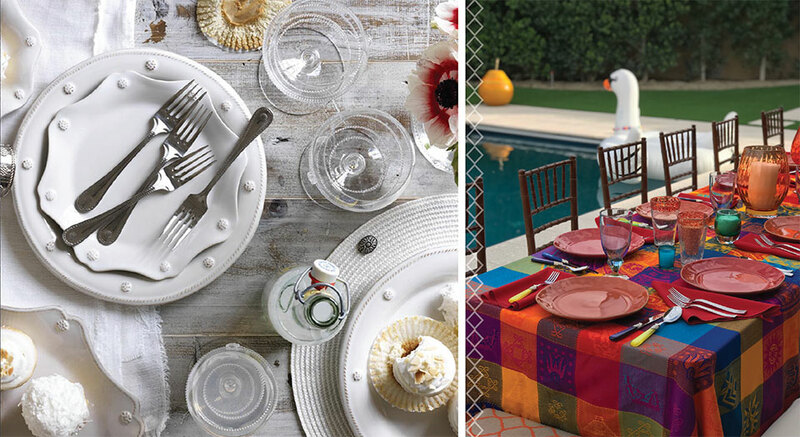 Toys, flora, trinkets, and art can all be incorporated as accessories to a beautiful table setting. “Of course there are napkins and dishes specially made for summer but you can truly make anything look special. For example, I like to tuck rosemary or thyme into my napkin rings to bring a sense of freshness and aroma,” Murphy says. What better season to get creative than during the summer? Murphy isn’t shy about her preference for the season. “I love summer. I love to cook. I love to entertain,” she says. She tells stories of bringing people together, serving many meals outside or with the doors and windows open. She sees how kitchens and entertaining ties people together. Just so, a well-formed tabletop will tie together a room. In some ways, Murphy has go-to pieces that she loves to collect. Dishware from Juliska Dishes and Christian Lacroix are two favorites. Yet, she also has a sense for finding something out of the ordinary. Twenty years ago, she walked into a tiny shop in Paris called Astier de Villatte and discovered hand-made dishware that she still sources today. 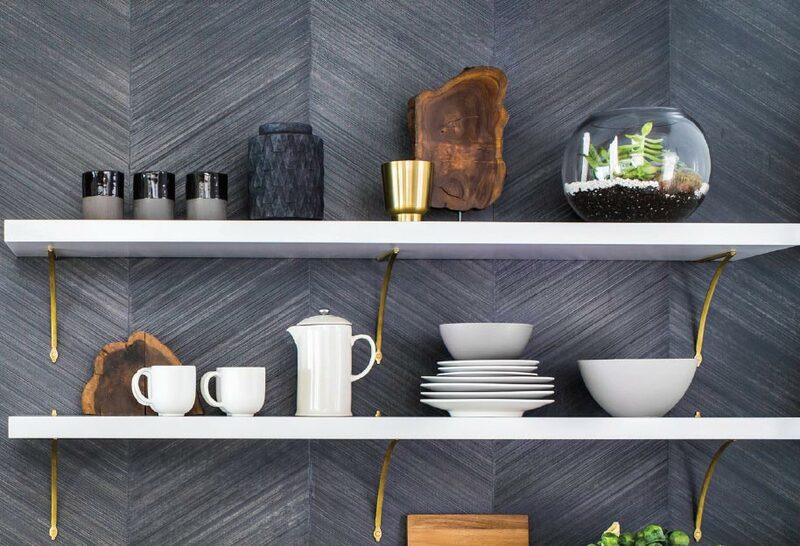 “The great thing about dishes and accessories is that you can change them as often as you want,” says Murphy. “If it breaks, you get a new one. You can mix and match. You can completely change the feel of a room based on what you put on your table.” In other words, tabletop selection can be fun and free. Although you’re not going to change your major installations every season, why not change what’s on top of them? Murphy’s shop has an open-door policy. Even if you’re just strolling past, you (and your dog—there are treats ready for any furry visitors) are welcome to dip in and see what inspires you. Face-to-face interactions allow for the best possible selection. In a world dominated by online commerce, Murphy cannot stress enough the value of holding goods in your hands. For her part, Murphy looks forward to another inspiring season of bright lights, popping color, and finding the perfect pieces to bring life to her table. Lucky for us, she helps others do the same. Mountain Land Design is a born-and-raised western entity with national influence and a regional heart. With showrooms in Salt Lake City, Provo, Boise, Sun Valley, and Jackson Hole, they are rich with resources for getting their clients exactly the appliances, plumbing, and hardware they seek. Hardware manager Steve Stockfish joined the company in 1994, when the company was a small boutique showroom in Park City. Today, its success and commitment to quality is known throughout the Mountain West. Sometimes specific appliances can be overlooked initially, leaving potential challenges with crucial kitchen elements such as ventilation. Mountain Land Design works with architects and designers early on to make sure that kitchens are designed effectively. With Mountain Land Design’s expertise and experienced salespeople, there is always a solution. 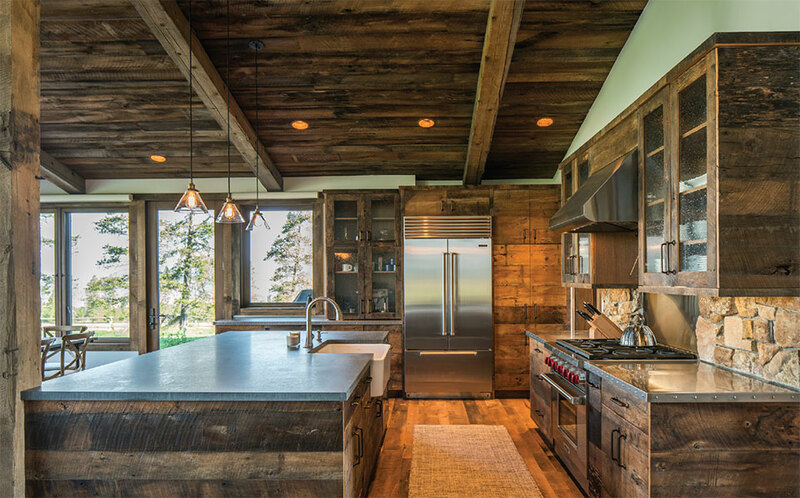 Mountain Land Design can fill the needs of an entire kitchen. In luxury mountain environments, that might mean equipping more than one cooking area, with several different uses and storage plans. The Mountain Land Design team works with each individual buyer by applying industry expertise to the needs of the client. 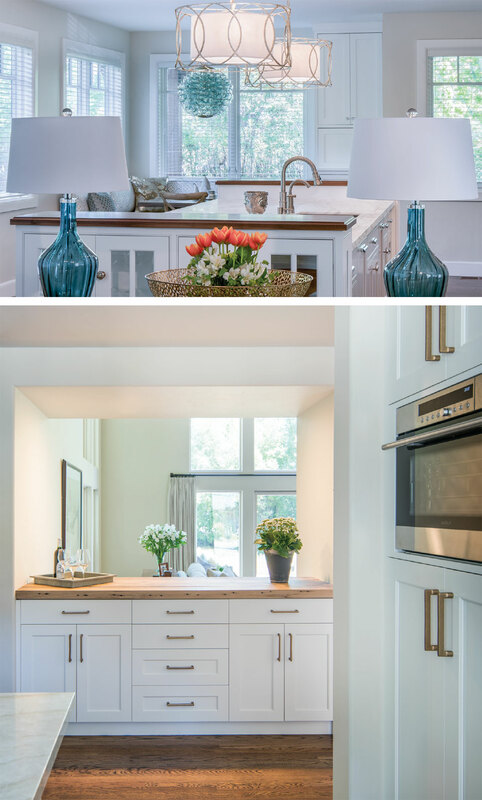 They help create a beautiful kitchen by collaborating with representatives from other trades such as cabinet makers, counter top suppliers, and lighting specialists. When it comes to hardware, the details make the difference. From calculating hardware quantities for an architectural plan, to selecting specific pieces, all the way through to delivery and installation, the Mountain Land Design team works hard to make sure the hardware is finished correctly the first time. The Mountain Land Design team is the best in the business. Most of the staff has been with Mountain Land Design for over a decade—that’s over a decade’s worth of weekly training, countless hours of customer service, and years of building relationships. Visit one of their showrooms to help inspire your dream project! Arianne Heyser and her team at Topnotch Fine Furnishings on Sun Valley Road have made a name for themselves in classic mountain interior design. 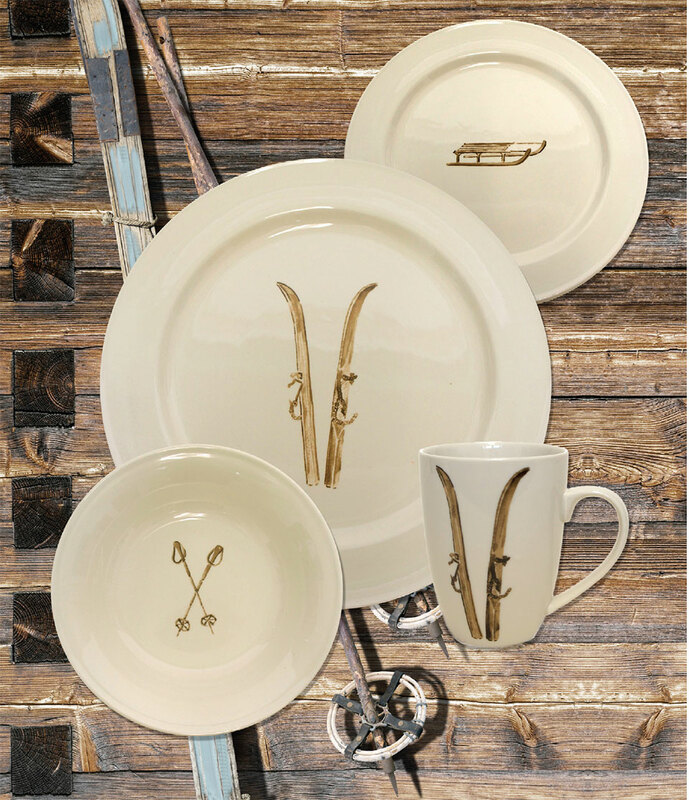 The full-service design team works with every room in the house, focusing on traditional and ski-inspired designs to create the perfect mountain space. Their expertise extends beyond cozy bedrooms and rustic living rooms into the space where families spend most of their time: the kitchen. With kitchens in particular, designers get to work with clients through the entire process, from start to finish. They are the liaisons between contractors, cabinetmakers, and clients, helping to achieve a personalized final product. Heyser loves this process because it allows her to really get to know her clients over time. Once the functional selections are in order, the fun starts. 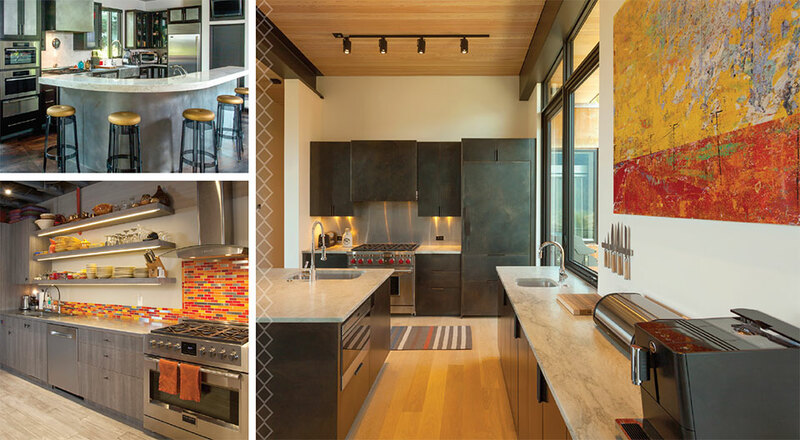 Heyser loves selecting textures and colors that add warmth, giving a welcoming feel to a kitchen. While much of the market abounds with contemporary style, she knows there will always be a place for the relaxing environment that a traditional mountain space provides. “I love sleek and beautiful, but I also love having a warm space where my kids can spill tomato juice. Kitchens are meant to be fun, filled with laughter, and open. Finishes with texture, movement, and color bring that to life for many people,” she says. 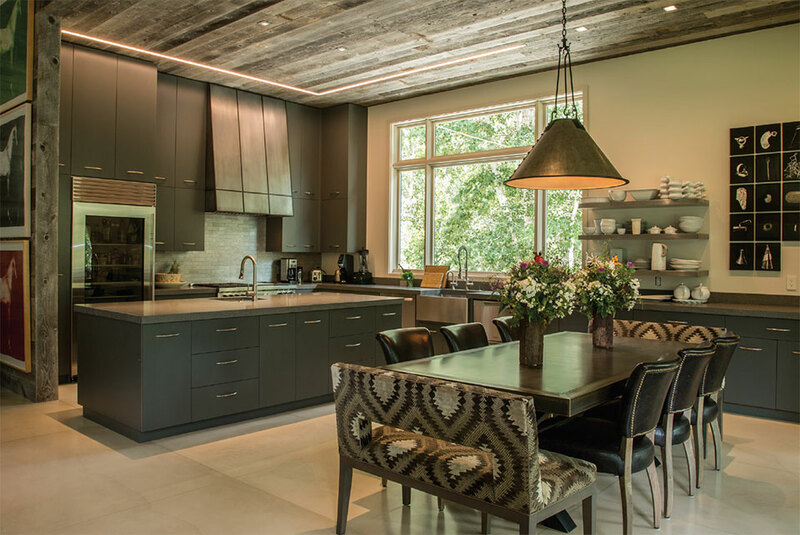 Describing several of her favorite projects, Heyser explains how mixing a lot of different elements make a kitchen both inviting and interesting. You can mix contemporary materials, like glass and flat color, with traditional looks of barn wood and rustic hardware. The end result creates a space that will last for decades. 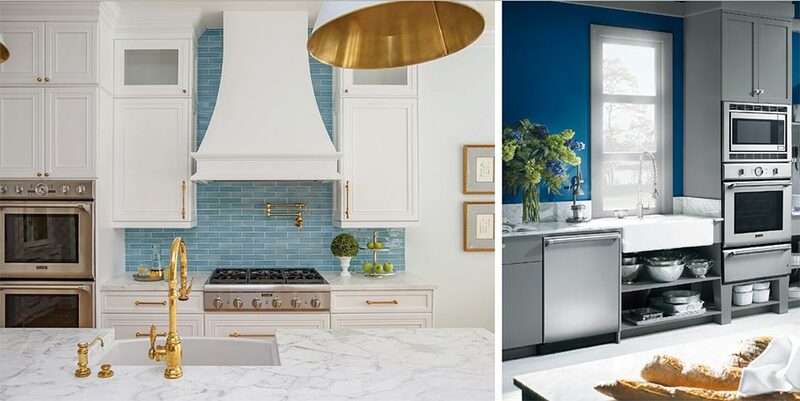 Built into her job is a sense for detail, and Heyser will help select pieces based on what her clients’ personalities portray, like Thermador blue cooktop knobs. “There’s so much going on in a kitchen, but also a strong technical aspect,” she notes, describing how she dials in designs, down to the tenth of an inch. “You need to tie together everything to have symmetry, depth, color, and warmth, as well as basic functionality to suit the client.” She notes that other aesthetic elements might include drawer coverings, hidden appliances, as well as rethinking a working triangle for the cooking needs of a homeowner. In addition to communicating and project managing, Heyser’s job is to tie together the final pieces of a kitchen. A final touch comes in the form of accessories, and Topnotch Fine Furnishings has plenty from which to choose. Heyser and her design team have found their niche in designing kitchen spaces. Whether between contractors and clients, function and form, or the final details of a space, they connect the dots, resulting in warm, open spaces for all to enjoy. Utah-based Hammerton has watched the evolution of the kitchen space from a front-row seat. 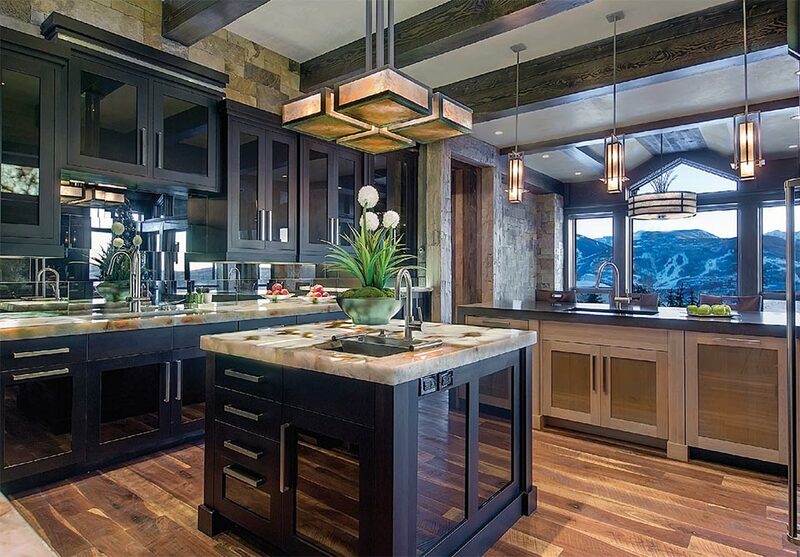 Two decades ago, the custom lighting manufacturer put itself on the map by building rustic pinecone-laden steel chandeliers for luxury ski homes going up across the Intermountain West. But the lighting industry has changed dramatically since that era, and Hammerton has been on the forefront of this transformation. Today the company’s work emphasizes contemporary designs, artisan glass materials, and LED—all designed and handcrafted in their 50,000-square-foot Salt Lake City facility.